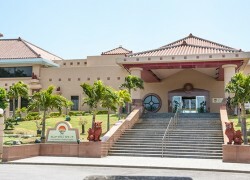 Including Jacuzzis, saunas, seawater swimming pools, slides and an open-air iwaburo (a bath made using rocks), Kariyushi Kanna Thalasso Laguna features 14 types of facilities, all which allow you to enjoy exercises while taking advantage of the buoyancy and other beneficial effects of the water. Relaxation time spent in one of the Jacuzzis on the outdoor terrace while taking in the grand ocean view is second to none. You can treat yourself to a watsu (a form of body therapy conducted in warm water) session, or beauty treatments at the salon located on the third floor. The restaurant on the first floor is a perfect stop for a healthy meal.